Welcome to the 2018-19 season of the Havant Orchestras! Our players and audience greatly enjoyed our recent ‘Popular Classics’ HSO concert in Hayling, conducted by last year’s bursary holder Richard Miller with cello soloist Ruth Hallows. We wish them all success in their future musical endeavours. 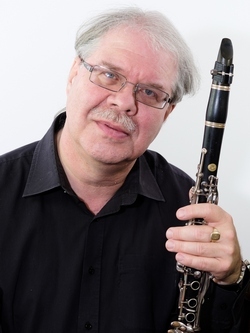 Our HCO concert on Saturday is ‘Mostly Mozart’, but covers a range from his ‘Mitridate’ overture, for an opera written when he was only 14, to the famous clarinet concerto, his last purely instrumental composition, in which the soloist is our outstanding principal clarinet Rob Blanken. After the interval, we have an overture by Mozart’s older friend Joseph Haydn, then Mozart’s ‘Linz’ Symphony, which was written in just a few days when Mozart was staying briefly in Linz and needed new music for an orchestral concert. HCO will be using the new layout which we tried out last May, with the orchestra in front of the stage. To allow more space for the orchestra, some of the previous seats at the front have now been removed, and seating price bands have been adjusted accordingly, mainly to reflect changes in sight lines. 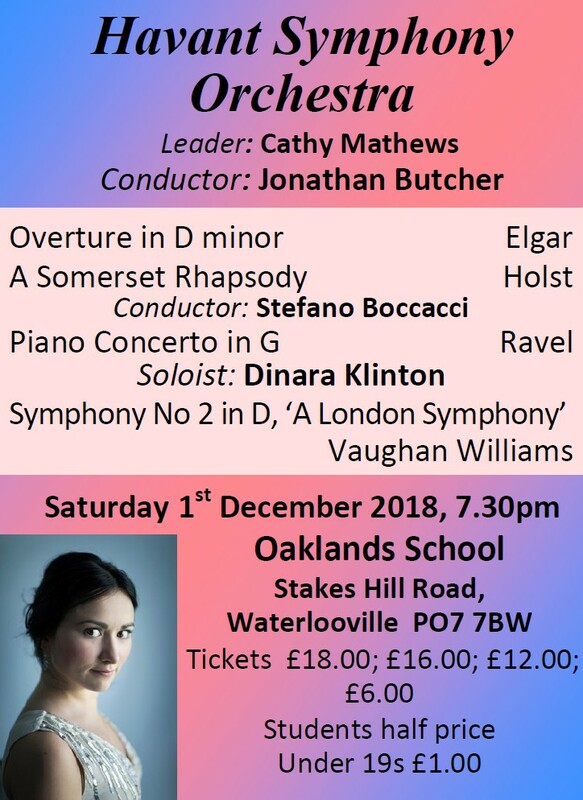 This change was made after the brochures were printed, so the layout in the brochure is only approximate, but the current layout is shown accurately on the Tickets page on the Havant Orchestras website. Looking further ahead, we are planning a very special concert on the afternoon of Sunday 3rd March 2019 to celebrate our memories of Peter Craddock, the founder of the Havant Orchestras, who passed away in 2017. For more details see below. We are extremely grateful to former bursary holders and current distinguished conductors Mark Wigglesworth and Toby Purser for their help in setting up and conducting this concert, and to our current bursary holder Stefano Boccacci who will be conducting the last movement of Maurice Blower’s Symphony in C, for which Peter prepared and conducted HSO’s World Premiere performance in 2008. 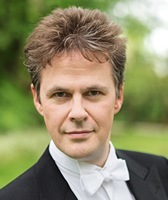 Our soloist Rob Blanken and conductor Robin Browning will be discussing Mozart and the works in the concert. The pre-concert interlude in the Octagon Lounge will be given by the Simojoki Family Ensemble. The programme will include chamber music and a couple of solo pieces: Mozart, Haydn, Sibelius and Schubert. Welcome to another fabulous season at Ferneham Hall. As always, we’ve come up with an eclectic mix of great music featuring some wonderful soloists, all of which can’t fail but to entrance and entertain. Beyond this, we’re also making some changes – we hope for the better – and would love to hear your thoughts and feedback about them. Those who came to our season’s finale in May won’t only have heard Dvorak and Mozart, but you’ll have been part of our pilot to test the hall’s acoustics using a new orchestral placement. This marks the first of many changes which we hope will bring us, and our music, closer to you. As my personal musical journey has progressed, from violinist to conductor to arts leader (some of you may know I’m Artistic Director of SÓN, Orchestra in Association at Turner Sims, Southampton) I’ve realised that, as musicians, we need to reach out to our audiences more than ever. We need to offer greater value to every single person who comes. Performing some of the greatest artwork ever conceived, well-prepared and passionately played, is only one part of the pie-chart now. In my experience most audience members love to learn a little bit more. A little more about the music, the soloists, about how things work, gain a glimpse behind-the-scenes, and even about the most misunderstood element of any orchestra – the conductor! Not everyone is curious, or appreciates the pre-concert talks or the inter-item tidbits, it’s true. But most do. Of course there’s something called the interweb now, and people can read programme notes too, but nothing engages more and builds deeper relationships with all of you – our audience – than some personal dialogue across the concert stage and beyond. Despite all the YouTube videos online – offering fly-on-the-wall documentaries, insights into rehearsals, the lot – I believe the there’s a greater thirst than ever to explore what an orchestra is, how it does what it does, and how the music works. So with that in mind, one of the things we’re exploring with you this year is a revised pre-concert talk format. And I’m going to be throwing some musical ideas your way from the platform, between items. By the way, I regard the music and the performance as sacrosanct – that has not changed at all in my 25 years or so on the professional stage – so I’m not going to tell stories in the middle of slow movements, heaven forbid. But I’ll try to offer glimpses into the world of our musicians, the music we’re about to play, and what makes us all tick whilst we share these incredible pieces with you all. Partly because of that, of course, I’ve chosen a slightly different route here. I’d usually wax lyrical about a wonderful soloist we have coming up (he is wonderful, it goes without saying) or the music we’ll present in a few weeks. However, this time I’ll leave it until I’m on stage, surrounded by the musicians I love and the audience who support us. Ultimately, you’ll have to wait and see! Finally, if you’ve any thoughts about some things you might like to ask me, or a soloist, or perhaps one of our musicians at one of our pre-concert events then you can always fire them away at the time, or – if you tweet – send a quick thought or question to the orchestra (@HavantOrchestra) and we’ll do our best to respond during the evening. (c/w other Mozart overtures). Naxos 8550185 £6.25. (c/w Clarinet Quintet). Decca 4423902 £8.50. (c/w Symphonies nos. 99 and 100). Hanssler HAEN98014 £12.75. (c/w Symphonies nos. 33 and 27). Naxos 8550264 £6.24. 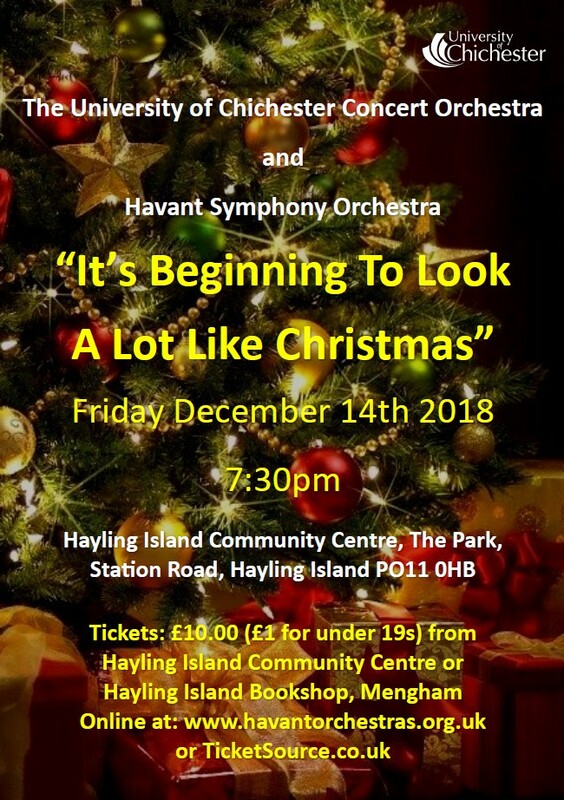 Following the success of last year’s enjoyable event, there will be another concert on the theme “It’s beginning to look a lot like Christmas!” at Hayling Island Community Centre on Friday 14th December at 7.30 pm. This time they are promising opportunities for audience participation! The concert will be performed by the The University of Chichester Concert Orchestra who are very generously donating most of the proceeds to HADOS. Some HSO players will be joining in and we are sharing the organisation of the event so do come along and enjoy some Christmas favourites—it promises to be a superb evening and will (hopefully!) contribute to our funds. Tickets will be on sale online and at the Community Centre soon—keep an eye on our website for the latest information! Further details including ticket arrangements will be made available soon.